I believe we can’t help what we’re drawn to. The things that stir our soul are far greater, they allude to our passion within. The ability to wander, to step into a world other than our own, is something I believe to be a great privilege. And so, with passport in hand, I set off for Bali with the intention of uncovering the beauty of a country considered by many fellow Aussies an extension of our backyard. I’m grateful for a life of adventure with the American Express Explorer Credit Card, where will you travel to next? 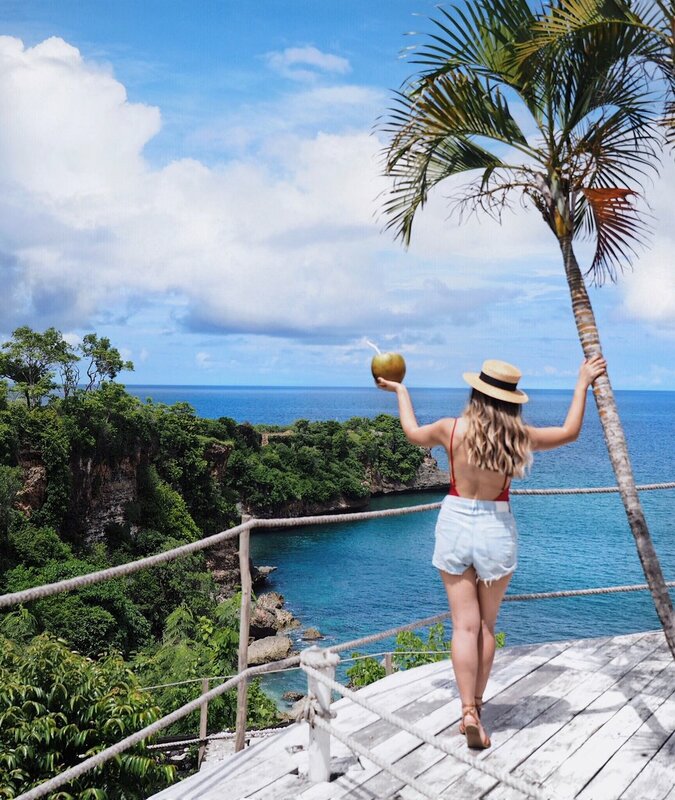 Bali as a travel destination has an incredible amount to offer; from its seemingly endless golden coastlines to the lush greenery of rainforests and terraced rice paddies. I’m drawn to Bali for all these reasons but to me Bali is undeniably coastal country. Where there are beaches, there are beach resorts and this is something Bali has in spades (along with trendy beach clubs, giving you the perfect option to not have to fork out on luxury accommodation). I focused my attention on one particular coastal area of Bali, Jimbaran Bay. Just south of Denpasar airport, Jimbaran Bay has a long beach with just a handful of resorts edged in cliffside. I had my heart set on two resorts that neighbor on this stretch, each a distinct experience from the other. One word comes to mind when I think of this Bali beauty, undiscovered. Cliffside glass bungalows overlooking uninterrupted endless blue. Massages to the sound of waves rolling in with a view to match. Waking up to sun rising over the ocean from a beautiful canopy bed. With only 12 glass-walled bungalows, La Joya Biu Biu captures the magical presence of remote and secluded paradise. Everything about my stay here looked and felt like utter luxury. The real beauty to it is that it won’t break the bank either. As a guest, you’re spoilt with a 15 minute back and shoulder massage in a beautiful open-air surround which will very quickly have you booking in for more massage treatments. And for about AUD$19 for an hour, why not indulge a little? As a guest of either hotel, you can spend a day at any of the 12 pools and beaches – it certainly makes for hard decisions. Each morning at the buffet breakfast we focused our efforts on the amazing fresh seasonal fruit. I couldn’t possibly tell you how much mango and pink dragonfruit was consumed, my favorites! Unforgettably AYANA (besides all the pools!) is exceptional service. I can’t even stress how much of a difference this makes to your stay. Each and every staff member, and there are many, go out of their way to connect with you. They seem to exude this stunningly rare quality, a desire to make you feel so very welcome. Being rainy season, it isn’t always possible to catch a sunset in December. I was fortunate enough to be sitting cozy in one of the cliffside lounges of Rockbar Bali on my last night. The scene is set on arrival as you hop aboard a motorized cable car down the cliffside. Taking in the view of a bar perched on a rocky outcrop over the clear aquamarine water is nothing short of magical. Rockbar is well known for being the ideal location for Bali’s fiery sunsets, I was not the least bit let down by the mesmerizing colors swirling through the sky. While travelling, I always ensure I have a credit card on hand. It helps having peace of mind in case an unexpected expense comes up but there are also a number of benefits, especially since you’ll likely be spending a pretty penny on your travels. Over the years, I’ve had a number of different credit cards however I’ve found that a travel specific card is one well-worth having in your wallet. The Amex Explorer Card provides exceptional experiences and services for all things travel related. Best of all, the card comes with $400 travel credit each year, offsetting the annual fee (win!). With 2 points for every dollar spent you’ll rack up points in no time, and with insurance including smartphone screen insurance (how have I never thought to get this before?) and travel insurance, the Amex Explorer Card has you covered.